The large speculators (non-commercials) increased their net-short position in silver for the third straight week. The last time they were net-short was in 2003 when silver rallied from $4.50 to $8.35 in 10-months (see bullish silver chart). Gold's COT improved with commercials reducing their short positions by 32,330 contracts. However, it remains moderately bearish at 351,473. 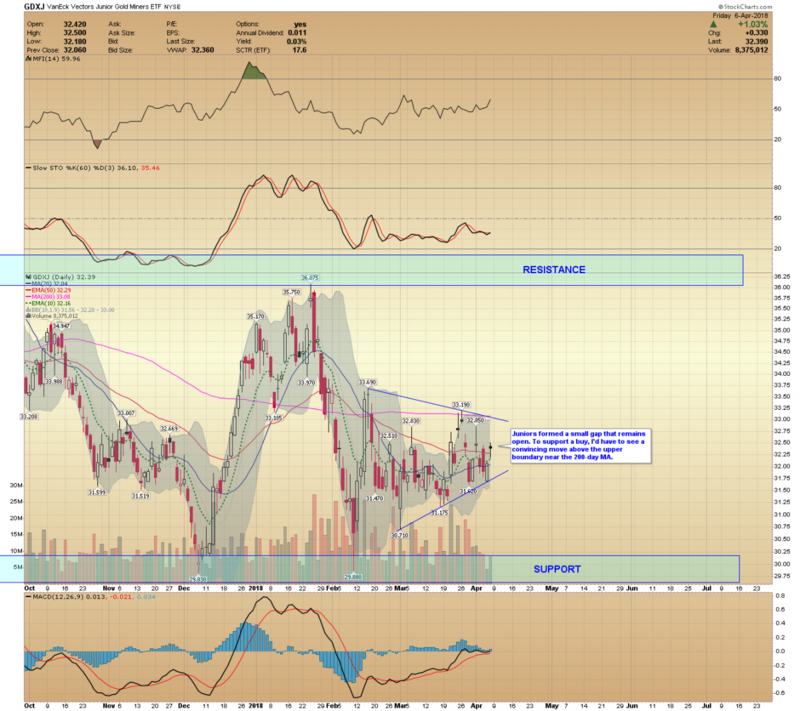 Metals and Miners have consolidated for 2-months, but a significant move is brewing. A quick spike lower is still possible but long-term investors may consider adding to physical holdings. Short-term traders should remain patient or risk additional whipsaws. 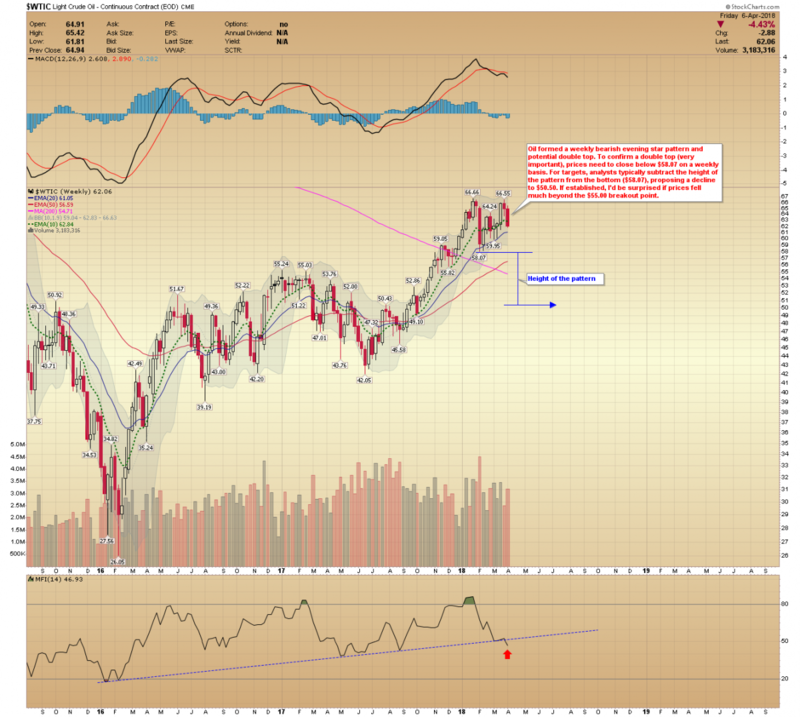 Oil and stocks formed bearish reversals on Friday. I see the potential for expedited selling if support fails early next week. The last time non-commercials (large speculators) were net-short was in 2003. Silver prices consolidated for several months and then broke sharply higher. Breaking out above the current consolidation line would support a run to $26.00 by late 2018 to early 2019. The March 23rd COT report revealed the first net short by non-commercials since 2003. They've increased their net-shorts three straight weeks to 16,965 contracts. Meanwhile, commercials (smart money) are low at 89,053. 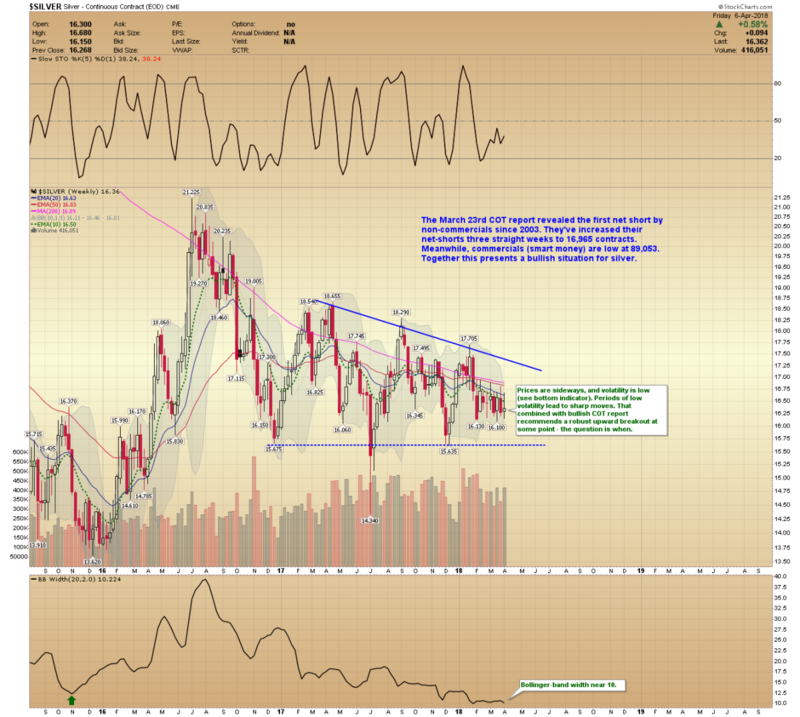 Together this presents a bullish situation for silver prices. Silver prices are sideways, and volatility is low (see bottom indicator). Periods of low volatility lead to sharp moves. That combined with bullish COT report recommends a robust upward breakout at some point - the question is when. Note: The Bollinger Band Width at the bottom. The 2-month range continues. 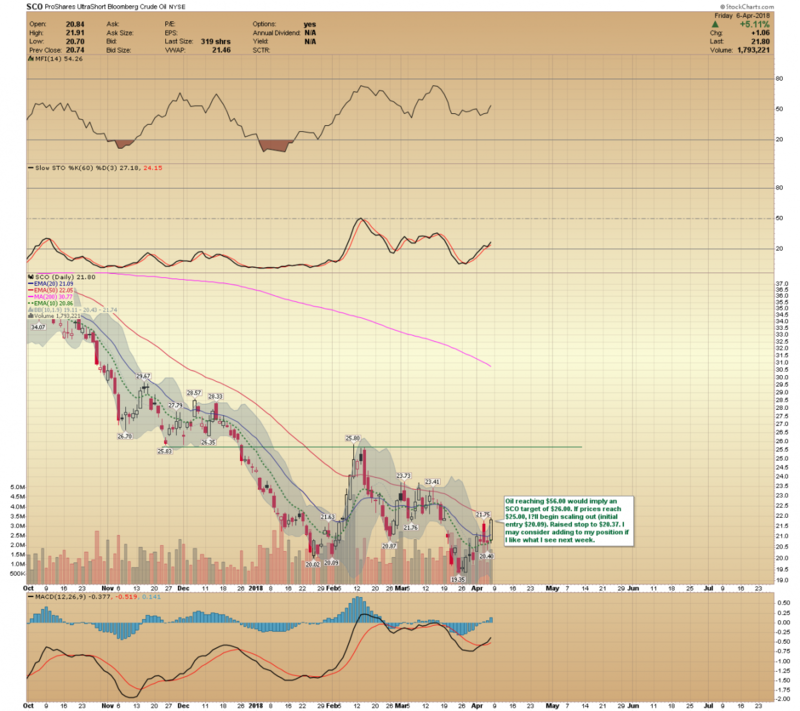 Silver needs to break above $17.00 or below $16.00 to resolve the stalemate. The bullish COT supports higher prices, but we can't rule out a quick spike lower first. I'm confident in the long-term bullish expectation. However, the short-term forecast is unresolved. The indicators are yielding mixed results, and the cycle status is unclear. The MFI (money flow index) is trending higher even though prices are below the March high (bullish). Friday's low ($1,322.60) is vital. Closing below it would be harmful and support a test and potential spike below $1310. Prices formed another gap at the open. In the last 10-trading days there have been seven opening gaps. Most closed quickly but it illustrates the chaotic behavior. 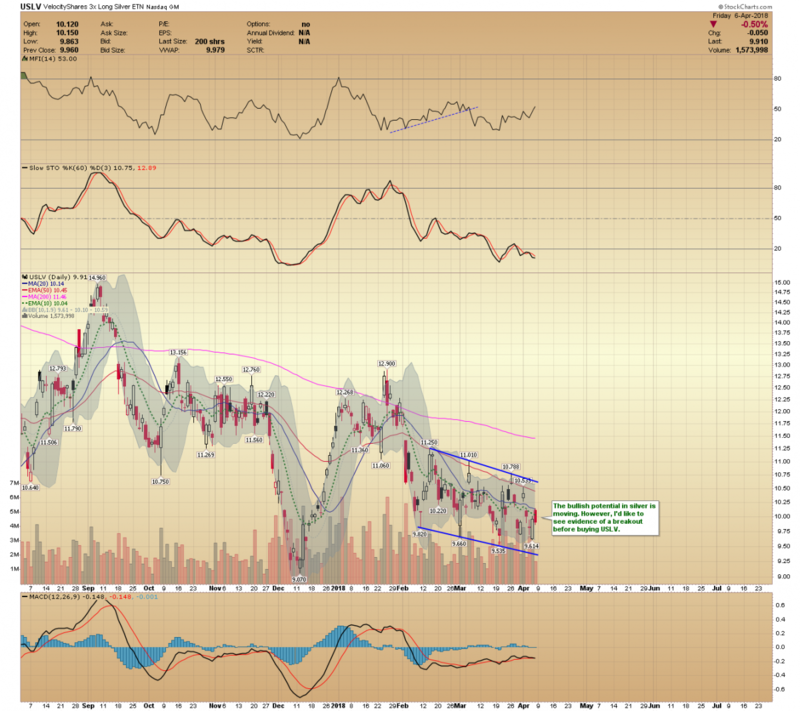 Miners need to break free from the small triangle for short-term direction. Juniors formed a small gap that remains open. To support a buy, I'd have to see a convincing move above the upper boundary near the 200-day MA. 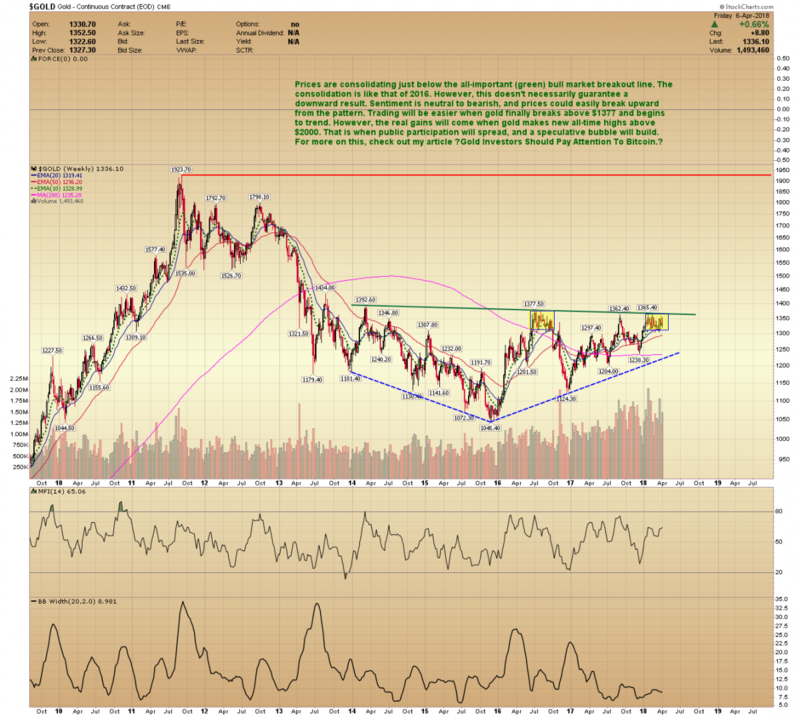 The bullish potential in silver is moving. However, I'd like to see evidence of a breakout before buying USLV. Stocks reversed sharply on Friday. Prices formed a bearish evening star pattern just below the bearish 20/50-day crossover. Closing below the 200-day MA early next week would likely lead to another selling event. If established, SPY would target around 240 (+/- 5-points). Reaching 240 would be a buy. I'd expect to see a rotation into energy and commodity stocks. 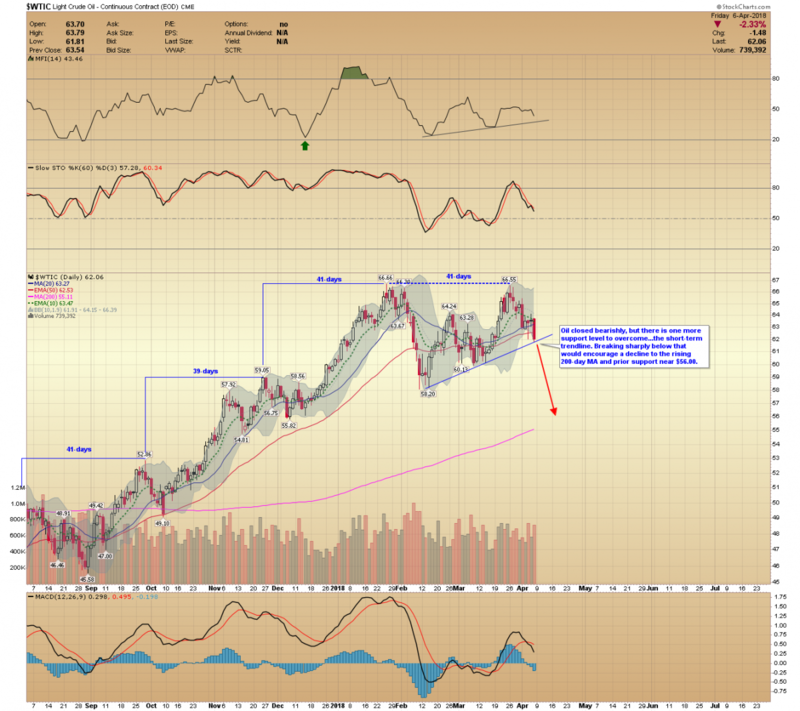 Oil formed a weekly bearish evening star pattern and potential double top. 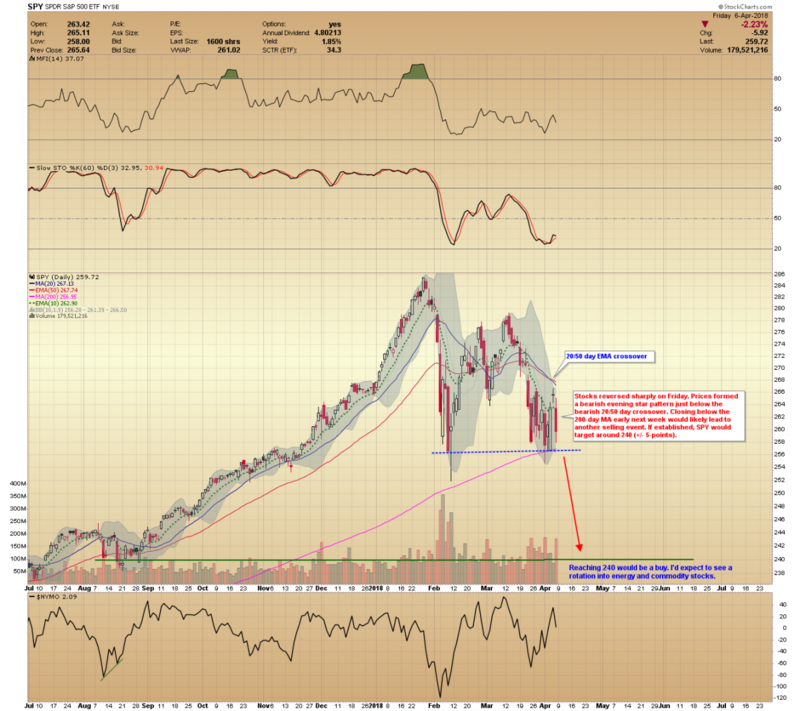 To confirm a double top (very important), prices need to close below $58.07 on a weekly basis. For targets, analysts typically subtract the height of the pattern from the bottom ($58.07), proposing a decline to $50.50. 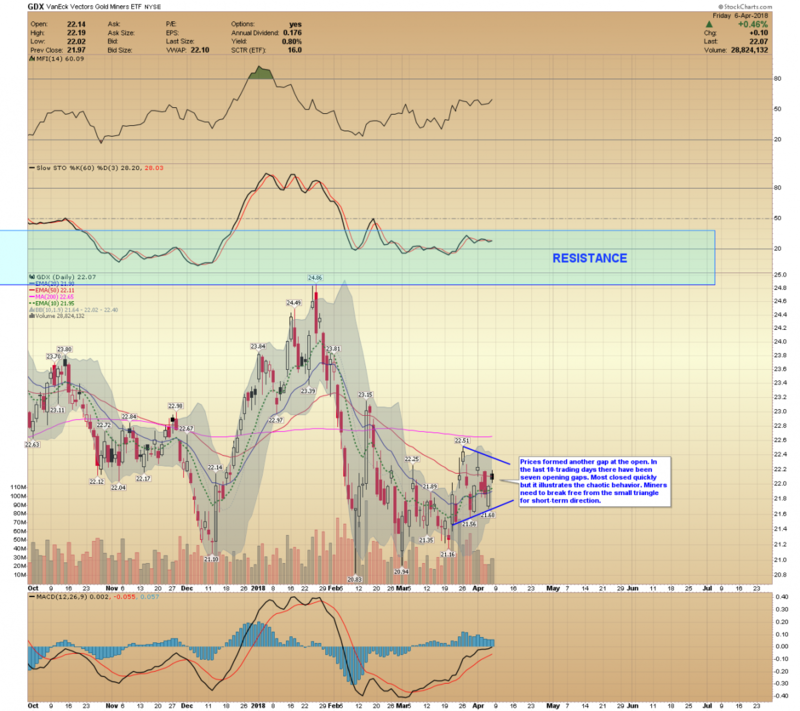 If established, I'd be surprised if prices fell much beyond the $55.00 breakout point. 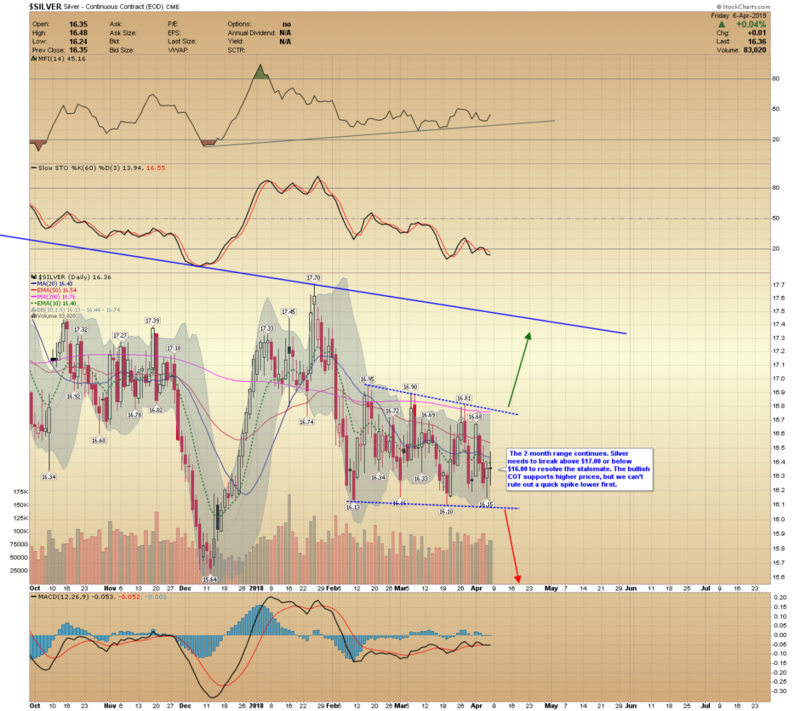 Oil closed bearishly, but there is one more support level to overcome...the short-term trendline. Breaking sharply below that would encourage a decline to the rising 200-day MA and prior support near $56.00. 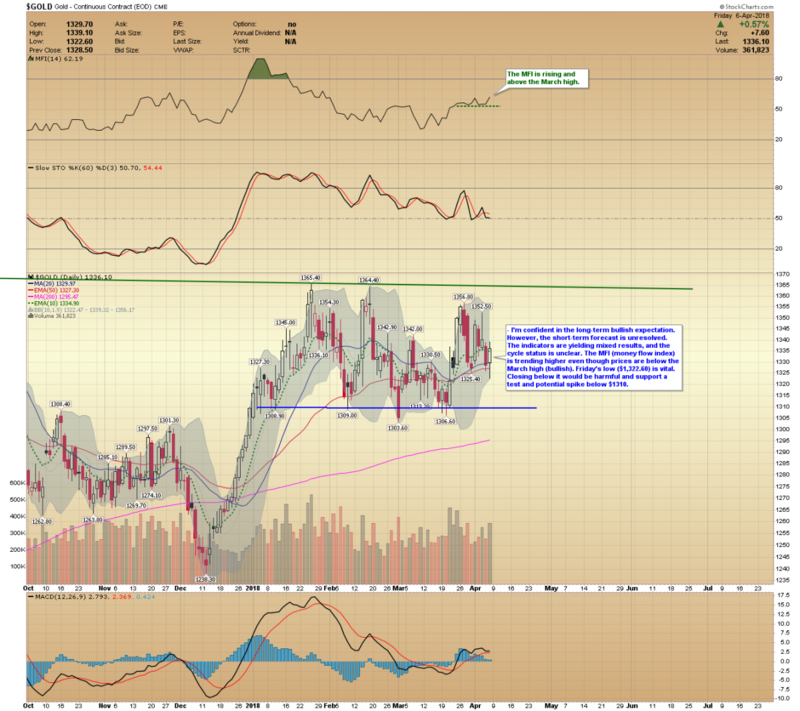 Oil reaching $56.00 would imply an SCO target of $26.00. Initial entry at $20.09. If prices reach $25.00 I’ll begin scaling out. Raised stop to $20.37. I may consider adding to my position if I like what I see next week. 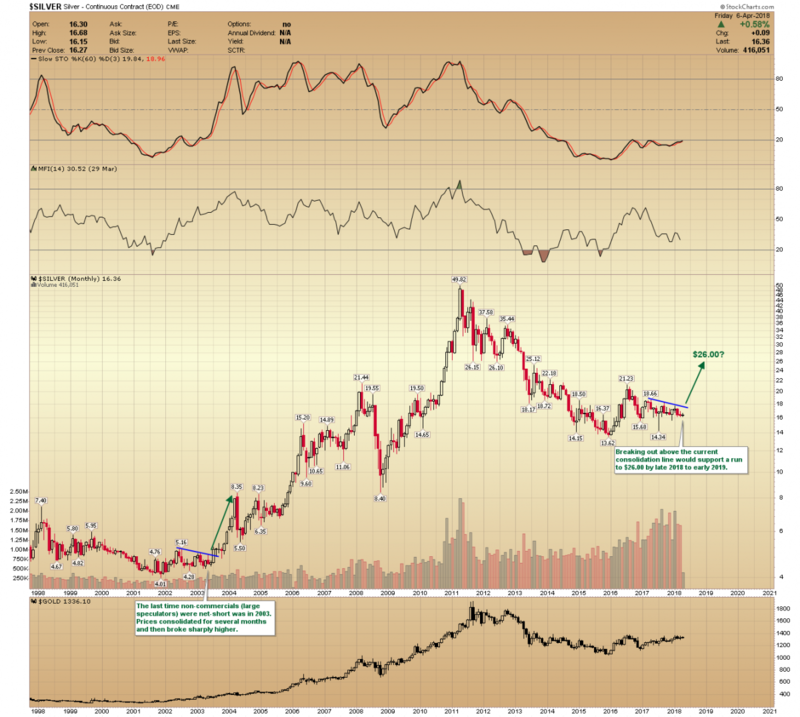 The bullish potential in silver prices is building and could produce sharp gains. Rallying above $18.00 will be the first step in this process. Once a breakout is confirmed, the trend should accelerate into late 2018.